Since the Stone Age, we humans have been strawberry connoisseurs. Originally, fragaria vesca(yep, wild strawberries) were cultivated in ancient Persia and later taken to the far East and Europe, where they were cultivated into garden strawberries, the ones we eat now. 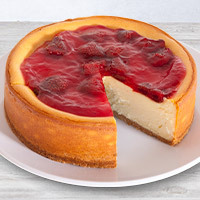 Because they've been such a staple in our diet over the course of history, it seems only natural that we pay homage to them with these delicious Strawberry Topped Cheesecakes. 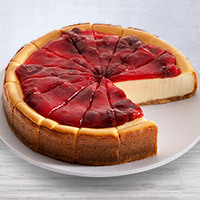 Our smooth cheesecake is topped with a delectable strawberry compote, paying perfect homage to an important fruit staple.